I just love this little pencil design pencil case. Instead of using scraps from the Oh Canada quilt, I decided to use batik scraps from some wallets I made recently. 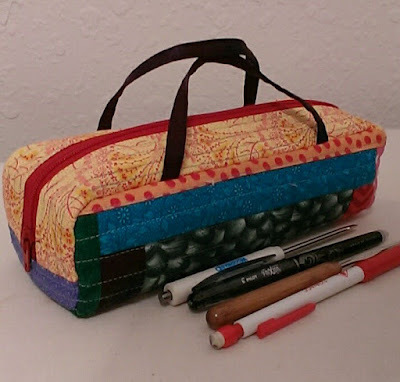 The front of the pencil case is now done. 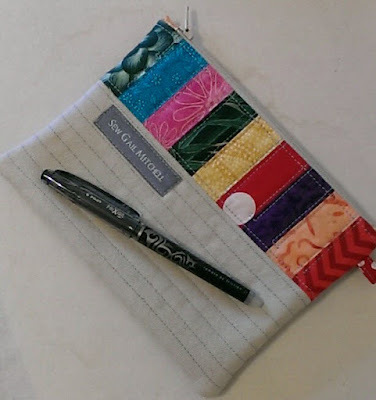 I stitched in the ditch using black thread to accentuate the lines of the sharpened pencils. 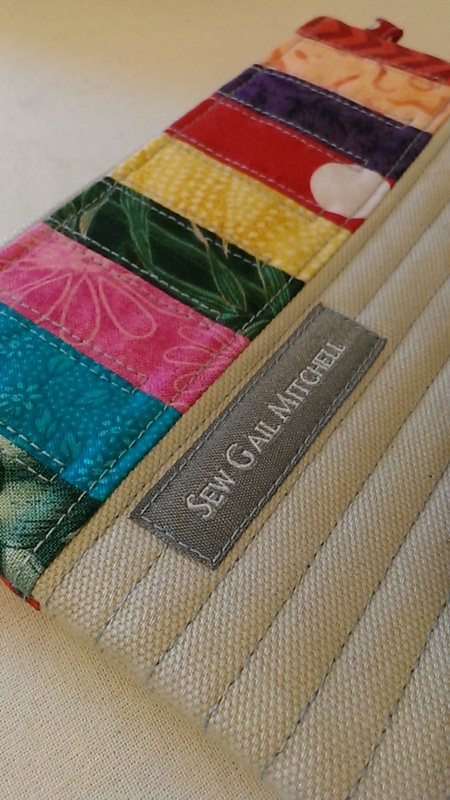 I just love the contract of the rustic osnaberg cotton next to the fine batik fabric. 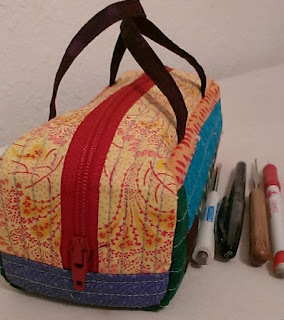 Next, I will machine quilt the back of the pencil case before putting it all together. I'm not sure what to quilt on the back, so I'm thinking on it. I'll show you the finished pencil pencil case in a few days..
Stitch in the ditch with black thread. Love the subtle detail that it brings out. And of course I've been sewing in short bits of time when we are indoors. 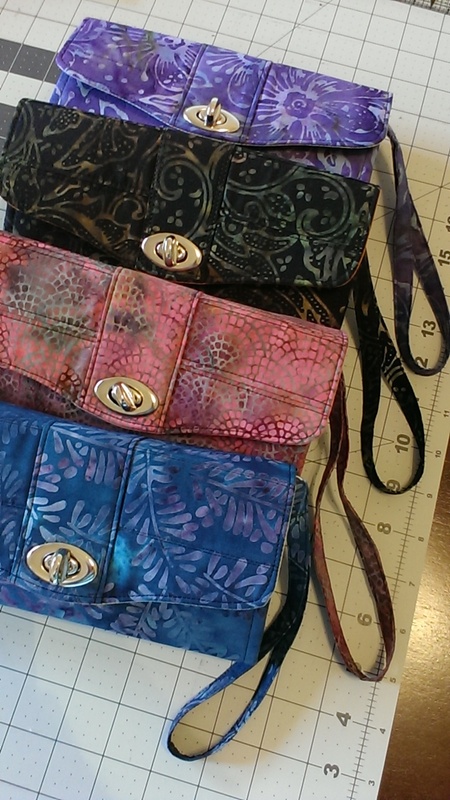 In the past two weeks I have cut out several wallets, and finished four this week. These will be part of a bunch that I send to my sister in Nova Scotia. Today I went to the little sewing group in the community, and one of the girls brought in a couple of books for me to borrow. 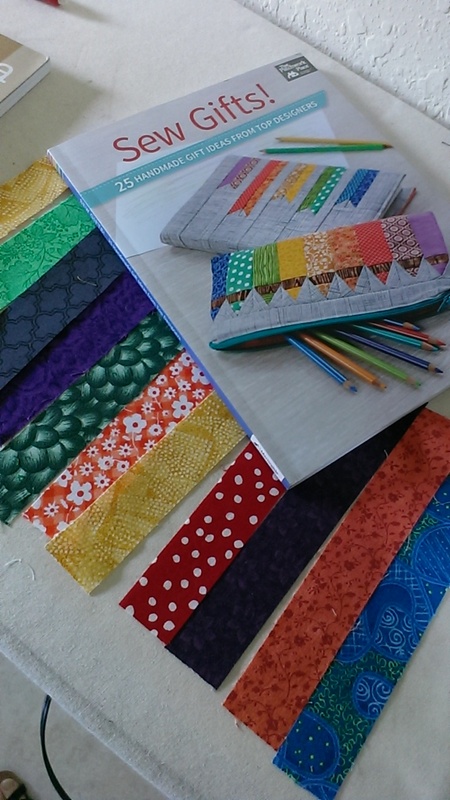 I love this book called Sew Gifts. As soon as I saw it, I thought of my Canada Quilt scraps. The pencil case on the cover of this book grabbed my eye. I came home and picked through my scraps. Ahh, it's such a cute design. I'll show you when I'm done. Another little bag made from my Oh Canada quilt scraps. 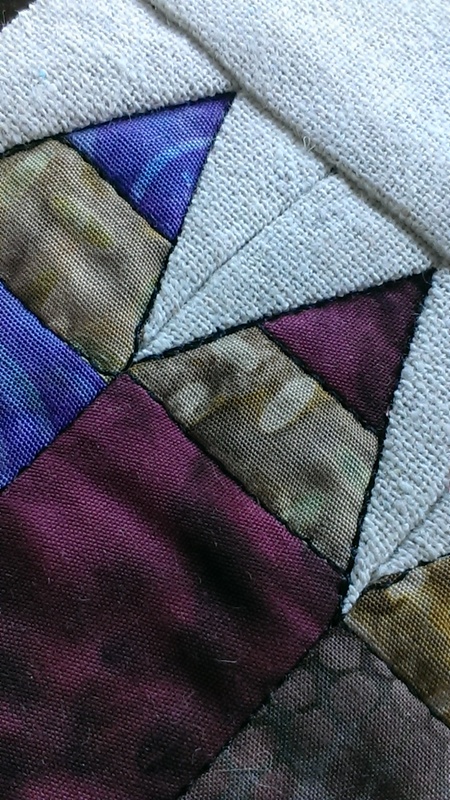 There were 7 others in the late November Oh Canada quilt class where we swapped fabric. I wonder if they are having as much fun with their leftovers as I am. This is the third little project I've made with them. 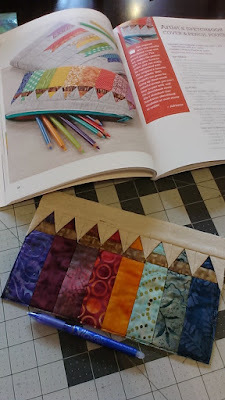 There are still enough small scraps left for another small project or two but I'm running out of ideas. I may just sew them together to make a stripe for the backing of the Oh Canada quilt. I couldn't resist this black grey and pink plaid suiting fabric in a fabric store a couple of weeks ago. I just purchased a quarter yard. I didn't know what I was going to make with it. I ended up pairing it with some gray and black fabric to make a wallet. I have a few bits left over. I'll save them to take home and make a coordinating coin purse. I really like it. 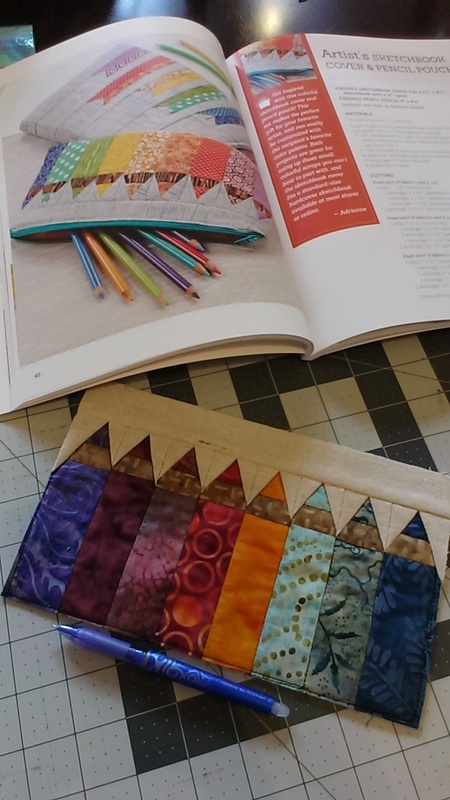 I think this will be my sample for my EdVentures 2016 summer wallet class next July. I saw this little project in a guild library book. I intended to give it a try long ago. I wrote down some brief details before returning the book and put it on my to do list. It's been months and maybe even a year or more.. 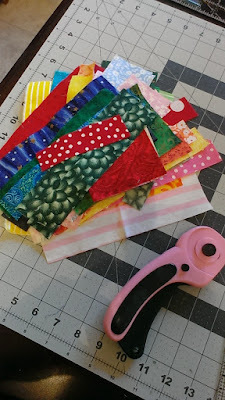 I had leftover scraps from my Oh Canada blocks. It was time to give it a try. Well, my notes were too brief..... it was trial and error. I persisted and made some adjustments and finished it. It turned out cute, but smaller than I thought it would come out. It's about 8" long by 2.5" wide and tall. 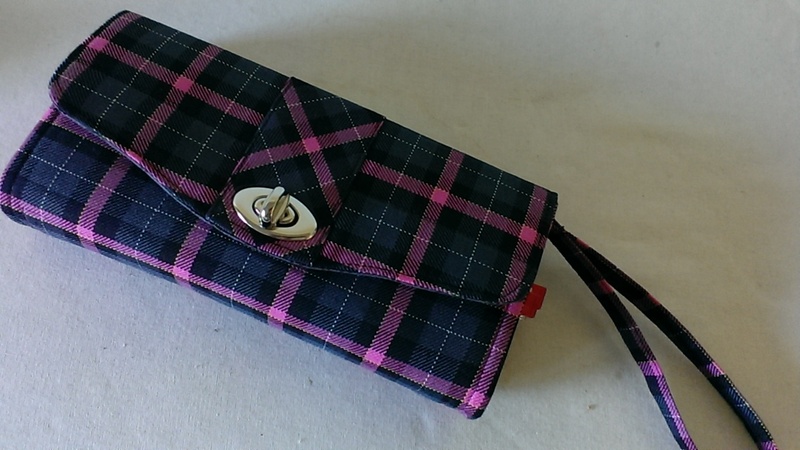 I'll add a nice zipper pull and use it to store some of my sewing notions in. I couldn't help with the extra K... I've been knitting in the evenings as we watch Netflix. 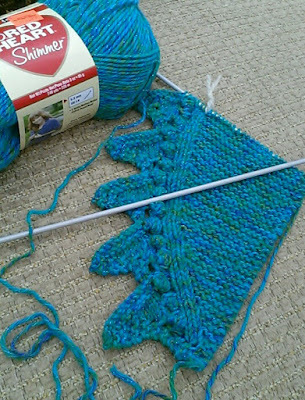 I started a scarf like this at home, and I was in the homestretch to finishing when it was time to head south here. I loved knitting in the evenings. It makes me feel productive.